The Koguryo Koreans are finished enough for Cancon 2013 so it was time to turn my attention back to the Hungarians. After sorting out the jumble that was the figures after transporting from Oz the other day, I looked at the figures needing painting as well as the time available. I have a business trip to Jakarta this week which means I will lose two night’s painting. Tuesday night I therefore decided to start on the war wagons. These are one of the two lots of figures I can’t borrow from Doug if needed and they are also the replacement for a camp for the Hungarians. I opted for a simple brown theme – brown wagon, brown horses (well, except for the one that will end up black) and the troops in a basic green and red livery (original for Hungarians huh?). 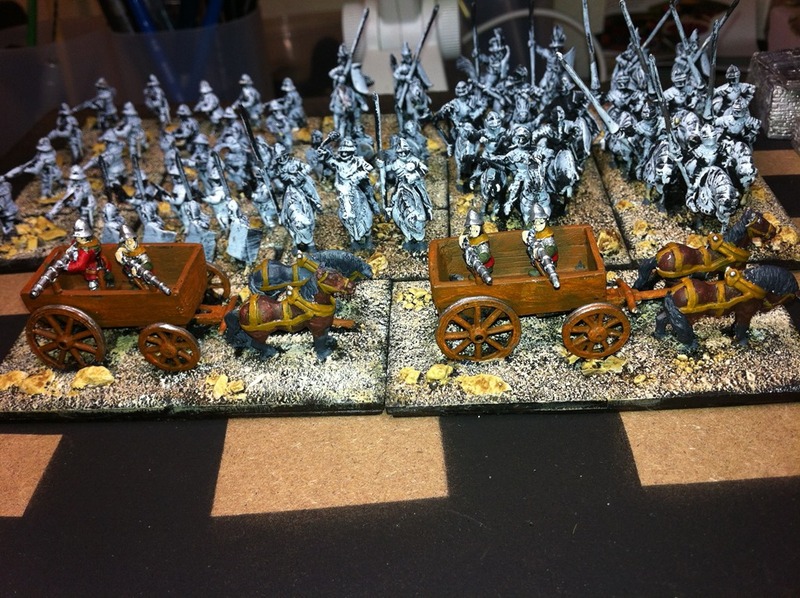 I managed to get two war wagons finished except for the final brown and black washes and the white socks and blazes for the horses. The paint jop ion these is really rough however the beauty of the iPhone is that the camera makes them look a lot better than they are. Next cab off the rank will be either the Knights or the Psiloi – this will be on Friday night and carry into the weekend I should think. I hope the other stuff will be simple enough to get through Monday to Wednesday nights! Crap! Not much painting time left. Knights should be easy… quick dab of horse colours – then silver followed by black wash everywhere else.. select lance colours, and Bob’s your uncle. I like your thinking – may make the lance pennons etc tonight!